Ahoy, you captains of industry! You're used to the finer things in life, such as Cuban cigars, 15-year-old scotch whisky, and $1,000-an-hour call girls. Why should you settle for anything less when it comes to charging your gadgets? 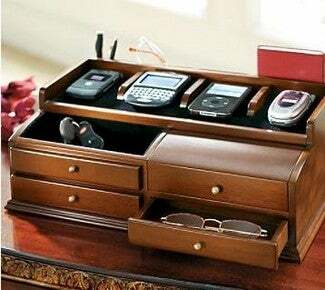 This mahogany charging station is totally classy, just like you pretend to be. It's got spots to hold all your various phones and music players while they charge, as well as little drawers to hold your Prada glasses and the keys to your Porsche.